Have you ever wondered why golf balls act the way they do? Why the perfect swing leads to disaster with the ball wildly veering left or right careening off three trees two squirrels and your golf partner before burying itself in a sand trap? Tom Wolfe knows and reveals all! 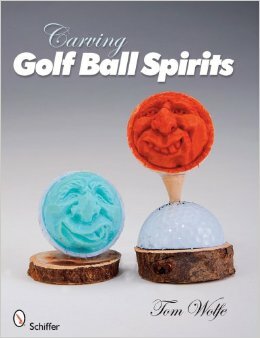 Follow Tom step-by-step through the process of carving two of the evil spirits and tiny demons that reside in the black heart of every golf ball. Every step is clearly explained and illustrated in color. The material within the golf ball is so easily carved it is almost the equivalent of doodling. Once the carving is complete bring the demon to life with a staining technique. A color gallery shows both the finished projects and many additional carvings for further inspiration.